It’s difficult to find a greater concentration of championship golf in such a small area. Within 30 minutes of Laughlin, you’ll find six courses spanning three U.S. states. Each is designed to appeal to all levels of play; at the same time, the courses’ many views of desert vistas, mountains and quintessential rugged terrain are simply breathtaking. Here’s a glimpse into what each Laughlin Tri-State region course has to offer. Located in a highly-desirable Bullhead City, Ariz. master-planned community, the David Druzisky-designed Laughlin Ranch championship course receives high marks from players. It offers dramatic elevation changes, bridges, bunkers, wide fairways and GPS systems on all golf carts. The elegant Laughlin Ranch clubhouse is relaxed and casual but also brings first-class dining and a full-service day spa for unwinding and pampering. Views of scenic desert abound from nearly every restaurant seat, building corner and course tee. The destination is also popular for weddings and group events, too. 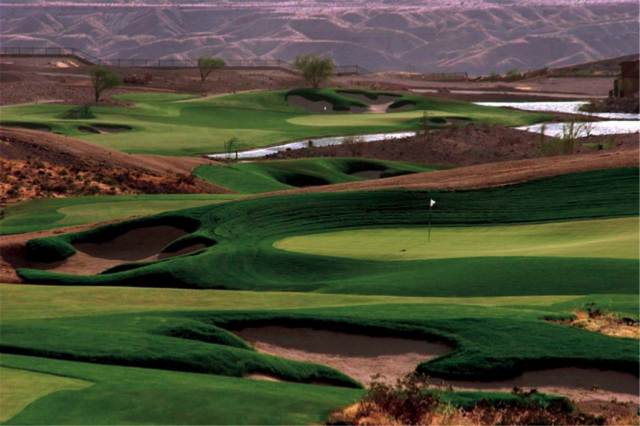 The Fort Mohave, Ariz. Los Lagos is a public course that embraces the rolling natural desert terrain in its layout. With four sets of tees, there are stunning mountain views at each tee of this Ted Robinson, Sr.-designed championship course. There are friendly fairways and a practice facility with driving range. This public course certainly has a private, serene feel, landing it on many “must-play” lists. Another Fort Mohave course, Huukan Golf Club offers challenging greens and tree-lined fairways that tempt golfers of all playing levels. Reviewers often comment on the desert beauty, relaxed atmosphere, course walkability and extremely reasonable price. With a pro shop, driving range, snack shop and club rentals, Huukan is a favorite among locals, too. Just across the Nevada border from the Huukan, the Mojave Resort Golf Club championship course offers rolling terrain, wide and forgiving fairways and natural wind-shaped sand dunes. Its marshes are challenging but enjoyable and the clubhouse amenities like a bar and lounge, extensive practice area, comprehensive pro shop and carts with GPS providing detailed measurements between holes are all player favorites. The Lee Schmidt and Brian Curly-designed course touches the banks of the Colorado River and has been honored with four stars from Golf Digest. Golf course architect Matt Dye created El Rio’s championship layout, which has proven challenging but playable for golfers of all skill levels. About a 30-minute drive from Laughlin, El Rio has four holes with water features and tees ranging from 5,300 to 7,100 yards. El Rio players can take in stunning mountain views while appreciating the gentle rolling fairways during this world-class golf experience. The Spanish mission-style clubhouse also has a dining room, bar, patio and private meeting rooms and a well-stocked pro shop with the latest apparel. Located in the nearby City of Needles, Calif., Rivers Edge is also located on the banks of the Colorado River and its many large greens challenge all player levels. Operated by the City of Needles, the course is known for being a great value and the newly-renovated Colorado Room and Scotts Rivers Edge Grill are popular for those looking to relax and enjoy a great meal after a day of play. To learn more about all Laughlin has to offer, go to visitlaughlin.com.